While I was on vacation last week a couple of companies released their yearly results (RELLA.CO and ASFI), and another holding of mine was finally sold (IAM.TO). I’ll briefly discuss the various developments. While the share price of Rella is up roughly 25% since I first wrote about the company it’s almost just as cheap today as it was then. The book value of Aller is growing while it’s repurchasing shares and paying out dividends, and as a result Rella is owning an increasingly bigger part of Aller. 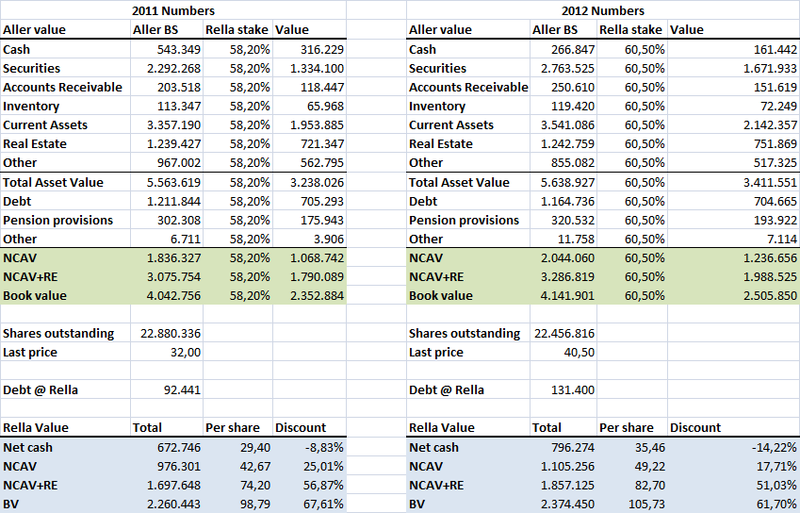 At the same time Rella is using the dividends received from Aller to repurchase it’s own shares. That’s a combination I like! Based on the current activity level and the 2012/13 budget figures from the leading subsidiaries and the accounts for the latest time periods, a result of primary activities (EBIT) of DKK 100-150m is expected. As long as Rella continues to trade significantly below tangible asset value, Aller remains profitable and both companies continue repurchasing shares I’m not going anywhere. After a bit of a delay Asta Funding finally published it’s 10K last week. I haven’t found any big surprises in the 10K compared with the press release that was issued a month ago. Due to some accounting peculiarities it’s not directly visible how cheap ASFI is based on it’s asset value, but it certainly is. The company has currently a $123M market cap while it owns $106M in cash and investments, and it does not have any big liabilities (there is only non-recourse debt). Besides the cash we find $12.3M in consumer receivables on the balance sheet and $18.6M is invested in the personal injury litigation financing business. Besides these assets that are visible on the balance sheet the company also owns a large number of consumer receivables that have zero book value (fully amortized portfolio’s). Last year these assets generated $36.4M in zero basis revenue. Since the company is not replacing it’s aging portfolio of consumer receivables we should expect that revenue’s will drop in the future, and this could become problematic if there are a lot of fixed costs. They can’t continue on the current path indefinitely. So this is something to keep an eye on, but so far ASFI is still cheap and using a lot of cash productively by repurchasing shares. Buying this company last year was a mistake. It looked cheap because it had a negative enterprise value and had a history of profitability, but in what could best be described as a beginners mistake I failed to realize that there were a lot of accounts payable and a lot less accounts receivable. So logically the company had to use a bunch of their cash this year, and IAM was not as cheap as I thought. At the same time the financial performance of the company was also disappointing last year. Since the company is very illiquid it took some time for me to exit my position, but managed to do so this month at a small loss (-3.4%). This entry was posted in Portfolio and tagged ASFI, IAM.TO, RELLA.CO on January 23, 2013 by Alpha Vulture. So I hear you thinking: this is all very interesting, but where is the opportunity? The opportunity lies within the fact that PPG shareholders can exchange their shares for GGC shares at a discounted price. $100 dollar worth of PPG shares can be exchanged for $111 worth of GGC shares. 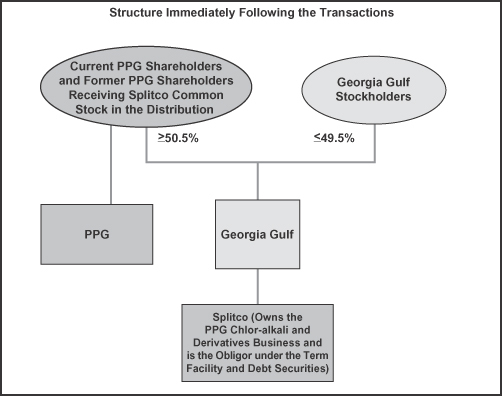 Because GGC is significantly smaller than PPG not all PPG shares can be accepted in the exchange offer: PPG has 153M shares outstanding and approximately 10.7 million PPG shares can be exchanged for GGC shares. Given the title of the post you can guess that there is an exception: if you own less than 100 PPG shares (an odd lot) you can exchange your shares for GGC shares without being prorated. Given the fact that PPG is trading for ~$143/share this means that you can create a sizable position, and that the expected profit for a long PPG/short GGC trade is a not too shabby ~1500 dollars. How much you will make on the trade is at the moment not yet known, because the number of GGC shares you will receive for every PPG share is not yet determined. This will be based on the VWAP prices of both stocks on 23, 24 and 25 January. Indicative values are provided daily by PPG. I have created a very simple spreadsheet that can be used to calculate the expected profit of the trade based on the current share price of PPG/GGC, and the latest ‘Indicative Calculated Per-Share Value’. As is visible the expected value of the trade today is lower than what you would expect based on the 1.11x exchange ratio. This is because the exchange ratio is calculated using the 3 day average VWAP price, and not the current market price. So you are expected to make 11.1% on a ~14K position, but it could be a bit more or less depending on when you initiate your position and how PPG and GGC will trade relative to each other the last days. A related problem is that you also don’t know yet how many GGC shares you should short to remove most of the market risk from the position. I will simply wait till the last moment to initiate my position. My broker (Interactive Brokers) allows you to tender shares that are bought in the morning of January 25, and at that time the exchange ratio will be mostly fixed. Other brokers often require that you buy several days in advance to be able to participate in a tender offer. In that case hedging is a bit more difficult, but don’t think that’s really problematic. If you are expected to make ~11% you can handle some negative variance without losing money, and you could get some positive variance as well. This entry was posted in Portfolio and tagged GGC, PPG on January 21, 2013 by Alpha Vulture.